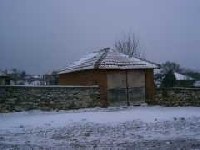 The village of Lesevo is next to the new Turkish border and only 40 kilometers from Greece if you want to buy a property in Bulgaria and visit two other countries while you are here on holiday this is the one for you. The house is in a resonable state but needs modernization There is a large garden with outbuildings and garage. Nice views too We always have a good selection of properties for sale Bulgaria. Bulgarian properties remain a top choice for people looking for both investment and holiday homes. If you are thinking about buying property in Bulgaria and perhaps renovating, please click on the building tab on the home page. If you cannot see what you are looking for on the web site, please contact me. I am always able to find exactly what my clients are looking for. Bulgaria property investors are doing very well at present. The rate of growth is outstripping all expectations, this is thought to be the due to the imminent entry into the EU.